Abstract: The 20th century has seen a variety of major discoveries in science and technology, especially in the area of compound semiconductors, quantum devices, and nanotechnology. Nanoscale optoelectronics is a key area within nanotechnology, where modern design and fabrication tools allow us to realize compact devices with better efficiency and functionality than ever before. Our optoelectronic systems, like Natural systems, are inherently nanoscale at their heart, yet whereas nature has to use ions and Classical physics , we can use electrons and Quantum physics. Electrons in semiconductors can be 5 orders of magnitude lighter and 8 orders of magnitude faster than ions, and, because of this, we can when we need to, detect electrons and photons on time scales of 1 nanosecond and less. This talk will focus on recent advances in the atomic engineering of III-V semiconductor optoelectronic materials for a variety of applications important to everyday activities. These applications span many areas, including industrial quality control, public health and safety, and telecommunications. While our eyes only access a narrow part of the electromagnetic spectrum, some important applications require us to emit and/or detect at frequencies of light outside the visible. In some cases we need to see a single photon clearly, and in other cases we need high power lasers that emit over 1021 photons per second. In my talk, I will discuss problems and solutions relative to demonstrating devices spanning from ultraviolet (UV) to THz frequencies. UV devices (emitters and detectors) will be discussed first, followed by infrared lasers and cameras. In all cases, early attempts to develop these devices were limited by fundamental physical limitations such as material purity and size. Many of these limitations were overcome by moving towards lower dimensional “quantum well” and even smaller “quantum dot” architectures. It will be shown how intricate and subtle modern atomic engineering can be, and how, with quantum engineering, we can improve device performance tremendously. After having covered modern optoelectronics, I will also talk about some of the technological tools and tricks that go into making the best possible devices and obtaining world record performances. This includes paying meticulous attention to material growth, material characterization, device fabrication, and system demonstration. Finally, I will show how, over the course of 15+ years, starting from scratch, I founded the Center for Quantum Devices which has grown to become a world class research facility at Northwestern University. Biography: She joined Northwestern University, Evanston, IL, as a Walter P. Murphy Professor and Director of the Center for Quantum Devices in Fall 1991, where she created the undergraduate and graduate program in solid-state engineering and the Center for Quantum devices. She is the inventor of InP/GaInAs Quantum Well and Superlattices. 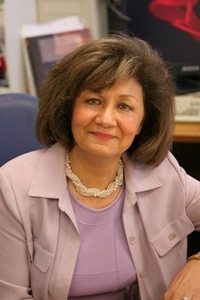 She is one of the leading scientists in the field of semiconductor science and technology, pioneering in the development and implementation of major modern epitaxial techniques. Her current research interest is in nanoscale optoelectronic quantum devices. She has authored or coauthored more than 1000 papers, more than 30 book chapters, and twelve books. She holds 30 U.S. patents and has given more than 1000 invited and plenary talks. She received the IBM Europe Science and Technology Prize in 1987, the Achievement Award from the SWE in 1995, the R.F. Bunshah Award in 2004 and many best paper awards. Dr. Razeghi is an elected Fellow of SWE (1995), SPIE (2000), IEC (2003), OSA (2004), APS (2004) IOP (2005), IEEE (2005) and MRS (2008).